Bookmaker Paddy Power outdid itself with this one. With a letter of support from the manager of the English Blind Football Team, they ran the below ad. In and of itself, it's pretty funny, and rather unbelievable. Not so, says the British ASA (Advertising Standards Authority), according to a BBC News report, which says it received nearly 1000 complaints about the ad (presumably not from anyone blind). Paddy Power counters that it is in support of the upcoming World Blind Football Championships starting August 14th in England. Personally, I'm miffed for two reasons. 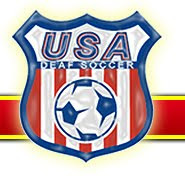 One, The USA didn't qualify and second that a group representing people with disabilities is ignored by people who feel that they know best. So, how does blind soccer work? Basically, padded touchlines, a special soccer ball that has what are called "rattle pods" inserted so as to make a noise as the ball moves on the concrete pitch, and 5 a side teams. Simple as that. All the other rules still apply. And for those of you thinking that these footballers don't know what they are doing, you're wrong. Some of these players have some serious skills as you see from this clip.